Colonel Willis Chapman’s B-25 Briefing Time now resides at the Mid-Atlantic Air Museum in Reading, Pa.
After the publication of his best-selling novel Catch-22, Joseph Heller usually chose to deny that any of his richly drawn characters were based on his actual wartime mates. However, to those who served with Heller in the 340th Bomb Group, the novel’s characters were indeed recognizable. 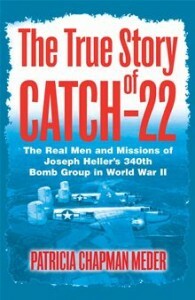 In this book, written by the daughter of the 340th Bomb Group’s commander, Colonel Willis Chapman, we finally encounter the real men and missions on which Heller’s novel was based. The Baltimore Post-Examiner is proud to present excerpts from Part I of The True Story of Catch-22 by Patricia Chapman Meder. At this book’s writing George bears some wounds from being 91 years old, but none of them are from having served in World War II. This is a phenomenal fact given that he, along with Fred Dyer, another pilot from his 488th squadron, holds the unofficial record, at 102 each, for the number of bombing missions flown in the history of that grim war. Both survived the war but, between them, they had been shot at and hit countless times, blasted by missiles, shrapnel and gunfire. They survived bailouts and crash landings, and lived to fly again and again, more than doubling the required number of missions, first set at 25, then raised to 35, and finally plateauing at 50. Their piloting skills were exceptional, their devotion to duty far exceeded expectations, and their bravery was beyond question. There is another interesting fact about George. Remarkably, he is the last surviving Air Force member from whom many of the characters in Joseph Heller’s classic novel, Catch-22, were loosely drawn. He is George L. Wells and he is, to a degree, also Captain Wren. Sandy haired and freckled, George, a child of the Depression, was raised in small town USA. Cedar Brook, N.J. sported a population of less than 300. His family, living about a mile outside of town, fared well for country folk prior to the Depression. He did all of the things boys do – attended school, played ball (especially baseball and soccer), became his 1937 senior class president, graduated, and got a job. Since his parents could not afford to send him to college, he started working as an apprentice in a print shop for $8.00 a week. After working for two years, union organizers came in and told him his salary would increase to $16.00 a week if the print shop employees voted to join the union. Of course, the employees voted for it but the print shop, in order to be able to accommodate the increased wages, laid off the last two persons hired, one of whom was George. In 1939, he was alerted by his older brother, Oliver, that his country was headed for war. On his advice, George joined the New Jersey National Guard and, with war drums beating, his life abruptly reeled into totally unfamiliar territory. Four demanding years later, in June of 1944, somewhat older and infinitely wiser, now battle- accomplished George was moved up to the U.S. Army Air Corp’s 340th Bomb Group based on the Mediterranean island of Corsica, a picturesque region of France. Here, on its airfield that had been scraped out of a briarroot patch parallel to the pristine, water-caressed shore, was where he was to remain until war’s end. This bomb group, the notorious “Unlucky 340th”, was where the paths eventually crossed of Capt. George L. Wells (Captain Wren), Col. Willis F. Chapman (Colonel Cathcart), General Robert D. Knapp (General Dreedle), Lt. Joseph Heller (Yossarian) and other men soon to be immortalized in literature. Here, in this bomb group, was where events began to unfold that would eventually thread their way through the pages of Catch-22. George had collected five months of hard-earned experience before Col. Chapman took command of the 340th, which was then based at the foot of Mt. Vesuvius in Pompeii, Italy. The original sculptors of this airfield had been British engineers who had whittled it out of a lush grape vineyard. With disbelief and great curiosity, Chapman arrived just in time to experience one very rare and very mammoth volcanic eruption as it hurled and spewed its molten guts directly over their airfield. The thundering, sky-splitting explosion proceeded to bury everyone and everything under a foot and a half of black, basketball sized rock, clinkers, and ash. It was as if Vesuvius the Magnificent had just been waiting to display its awesomeness. The force of its punch was of such magnitude that bombs and flak seemed the merest of play toys by comparison. Two months later Joseph Heller arrived, perhaps grateful to miss this scarring event that he would have relished. Both George and Joe were assigned to the 488th squadron, one of four under Chapman’s command. The 340th, in turn, was one of four groups under the leadership of General Knapp, a commander whose military career already had included WW l.
By this time, George knew war. He knew the routine of rising in the early dark of pre-dawn to fill a basin with cold water, wash, shave, down a cup of coffee with bread, all before hurrying off to the briefing room prior to flying another mission. He knew the sharp metallic crack of the truck tailgate dropping, rattling and clanking open to deposit the officers it had transported from that briefing’s coffee to the airstrip in front of a waiting B-25, which, like this crew, had been warmed up. And he knew, as he knew his own heartbeat, the sound, the sight, and the smell of that plane: that B-25 that was both dreaded as the deliverer to death’s door, trusted as their dearest friend under unforgiving fire, and worshiped, often as wounded as they were, as their sole means of a safe return home. Now, so many years later, George also knows every page of Catch-22. Author Joseph Heller’s ultimately classic novel (confuting Mark Twain’s definition of “a book which people praise but don’t read”) was born of those circumstances and took on a life of its own. George quickly recognized this book was his group’s life, his life. And, as the pages turned, he vacillated between clenched teeth and an insuppressible grin. This book belongs to the world but, more importantly, it belongs to him and his wartime buddies. Almost spot-on. The actual setting for this tale was a mere thirty-four miles southwest of Pianosa on the exquisite island of Corsica. This island with its wild and jagged mountains, its deep shadow covered valleys and its clear, cool mountain streams was formed through volcanic explosions and, while it was geographically closer to Italy, it was a region belonging to France. The island enjoyed a heritage of the temperate climate of the Mediterranean. The days of its coastal summers were hot and dry while slowly arriving winters eased in pleasantly mild and rainy relief, frequently evolving into heavy rainstorms. In spite of its very turbulent past, Corsica seemed created to be a place to enjoy life as pristine, clear waters gently lapped its eastern coastline. This was not a place to be touched by war. But here was where George, Joe, their 340th Bomb Group and 16 other United States military airfields were located. The umbrella 57th Bomb Wing was moved here in April, 1944 to give their planes solid striking power at their targets further north. These all were tactical bomber groups whose focuses were not these sunny beaches but strategic targets across those pristine waters in Italy. It was here that all of the action of Catch-22 could take place and here that all the factual action of Heller’s Bomb Group did take place. George had become a seasoned warrior by the time he encountered Joe Heller who was a combat replacement fresh, eager and, yes, naïve. George, 5’7” and just 24 years old, flew his first combat mission on October 26, 1943, mere months before 5’11 1/2” and just 21-year-old Lt. Heller arrived in the Group. But those few months were a lifetime in terms of experience. While each barely knew the other, still they shared, for a momentous period of time, a history together. They shared the adjustment of going from a life of the familiar; family, friends, ball games, the life of the American boy on American turf, to the unfamiliar of guns, war planes, death, and responsibilities, for not your friend’s missed homework assignment, but your friend’s very fragile life in a very foreign place. As a pilot George was keenly aware that he shouldered the lion’s share of responsibility for the safety of his entire crew. It was for him to decide the critical timing of almost every movement of his aircraft which affected, as well, the following five formation flying B-25s in his box of six. It was for him to keep vigilant, use his every left seat skill to evade gunfire and flak, and demand of his aircraft instant evasive maneuvers after “Bombs Away!” His was the decision, when his plane was riddled and crippled from the accuracy of the anti- aircraft guns manned by the tense and sweating hands of German foe so far below them, whether his men should bail out with all of the risks that entailed or whether he should risk their lives further by struggling to bring his mortally wounded plane safely home. Joe also wore a heavy cloak of responsibility. As a bombardier he learned to steel his nerves. This was not a position for the timid. As he sat in his exposed Plexiglas nose cone, in front of, and isolated from, the rest of the crew, he had to focus, with a singularity, on one paramount pinpoint target. When the B-25 made its final turn and veered toward this target, it was Joe, as bombardier, who took complete control and called the shots. Nothing was to distract from his tunnel vision of guiding that aircraft over that target. His bible was the continually drifting cross hairs on his gauge. His sole focus was to accurately drop his bombs on a tiny speck of a target some hundreds of miles away. If shells were exploding around him and death-dealing flak ripping through his aircraft’s skin, he must not be distracted. The entire crew knew that should they- should Joe, in fact- miss their target, they would be assigned to return on the following day to complete it, this time under even more dire conditions since the enemy below had been alerted and would be waiting. It was every man’s most urgent prayer that the bombs would drop with accuracy and their aircraft could instantly bounce up free of their weight, bank, climb to safety … and head home. As Joe glued himself to his bombsight, their lives were put on hold. Patricia Chapman Meder was born in San Antonio, Texas. Coming from a military family, she grew up in an international environment where her inborn passions for the horse and art flourished. She attended three universities, graduating for the University of Colorado in Boulder. Postgraduate schooling continued in Paris, France. She has held exhibits nationally and internationally including Washington, DC, Oregon, California, Paris, Vienna and Madrid. Her second book, What You Do Is Up To You, an inspirational book for young people, is now in progress. Home is currently northern Virginia with her husband Jim, a retired FBI Special Agent. Contact the author.